I recently attended a Catholic mass with a friend of mine. Theological differences aside, my thoroughly Protestant upbringing sprinkled with a hint of Catholic ancestry always causes these services to become a hesitant balancing act between feeling compelled by the beauty of millennia-old traditions, rituals, and symbolism, but also feeling quite alien to it all. My common lineage connects me deeply to it all in some ways, and yet I can’t help but feel a sense of otherness, as if I’d missed the tutorial to my own heritage. These same feelings of inextricable and reverential otherness returned in full force when I entered the hallway into David Oquendo’s exhibition at Solo(s) Project House in Newark, NJ. 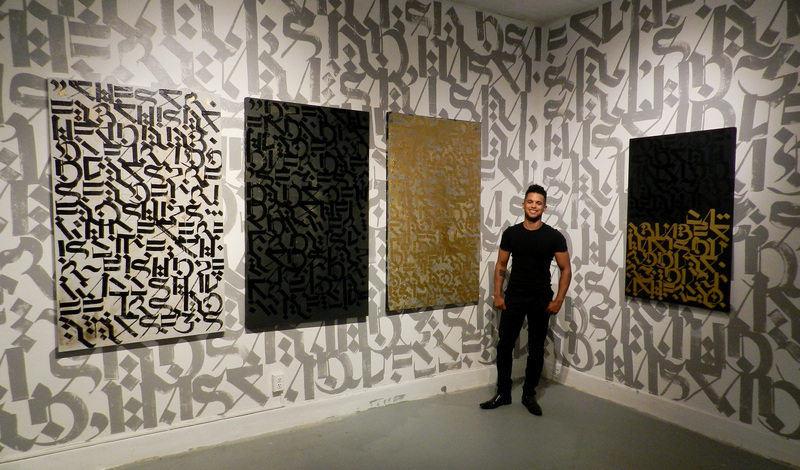 The culmination of a summer residency, Metaphrase: Idioms, envelopes the viewer in walls of gilded characters somewhere between a calligraphic Matrix and the Taj Mahal, punctuated by alluringly painted canvases filled with more of the same. Drawn into a ritual already underway, I felt beguiled by words I couldn’t read. Rigorous, aged-looking underpainting adorned with glossy letters of a Gothic-turned-Middle Eastern font not yet discovered beg the viewer to slow down and dare to interpret. But it quickly proves nearly impossible. 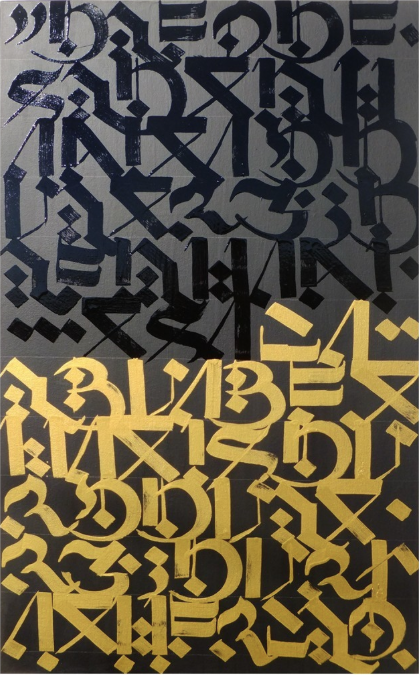 Oquendo explains the font to be an amalgamation of Blackletter, Hebrew, and Arabic. As if an attempt to change the unchangeable, he interfaces with what he refers to as “unchanging texts” like the Torah and Quran, developing over the last few years a sacred alphabet of his own. It evokes an aura of timelessness, yet hides its own meaning behind a script that looks as foreign as the room feels. This linguistic refusal of meaning fits into a long lineage of apophatic mysticism in which one attempts to encounter an unfathomable God by negating anything one can fathom. It is the meaning of unmeaning. Oquendo describes this in terms of his painting process, the passage from brushstroke to symbol, to meaning, to thwarting all that. His underpainting is likewise a laborious process of building up and scraping away, painting and un-painting, in some instances obscuring entire other compositions underneath. It’s an apophatic, mystical approach to underpainting – rather, un-der-painting, or “not-there-painting,” if I may take a page out of Oquendo’s code-mixing playbook and coin an English-Danish compound. The semiotics fall in line too. Derrida coined the French portmanteau différance, of words gathering meaning by both what they defer to and differ from. It speaks of the dialectical opposites of something being both what it is and what it isn’t. It’s a linguistic phenomenology of being and non-being, to which Oquendo’s Metaphrases point nicely. Unintelligibility and all, the work slows viewers and draws them in like the abyss of a linguistic Ad Reinhardt. It retains the gravity and substance of content even while refusing its content all the same. All the more reason for this Blackletter font, which Oquendo calls “the Helvetica of special occasions.” This is the font reserved for rights of passage, “birth certificates, death certificates, military proclamations, diplomas, major life events,” and tellingly, “even immigration paperwork.” It is the persistent font of otherness; of becoming something other. Indeed, this is the first time Oquendo’s art has overtly delt with these feelings of otherness. But this is not the trite, one-liner breed of dual-identity art, some meditative Deborah Kass or multi-ethnic Kehinde Wiley. Rather, it grows more conceptually fruitful the longer you spend with it. The calligraphy takes on an air of introspection, as if you had crawled inside the body of some immersive Zhang Huan performance. 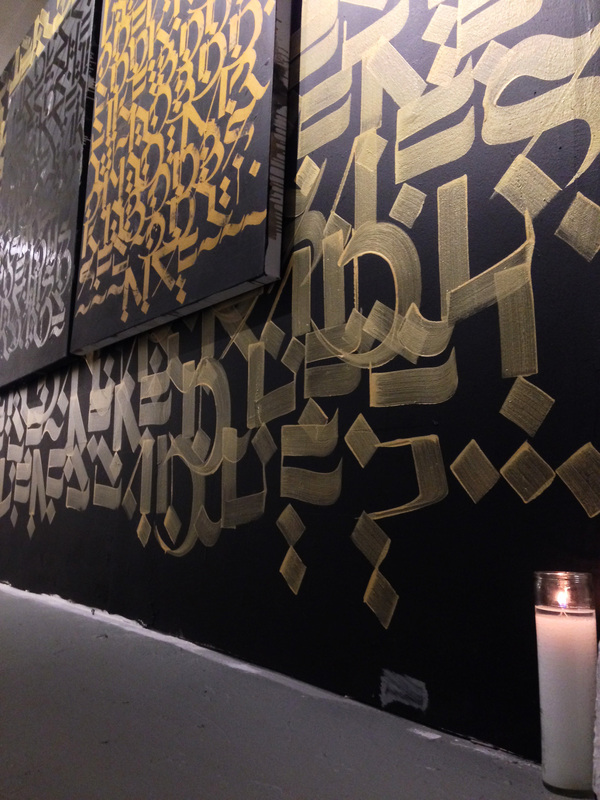 Those familiar with the namesake murals of Oquendo’s MonkPuppy Instagram handle may wonder how he pivoted towards this meditative pseudo-latino calligraphy. Just as his mystical lexicon refuses to be boxed, the shift to this new work owes to Oquendo’s own refusal to be boxed. He recounts his mentor, the late Denyse Tomasos telling him that his split heritage imbued him with “rich ingredients that people can relate to.” However, he remained reluctant, wanting to avoid tokenizing himself and encourage deeper dialogue. 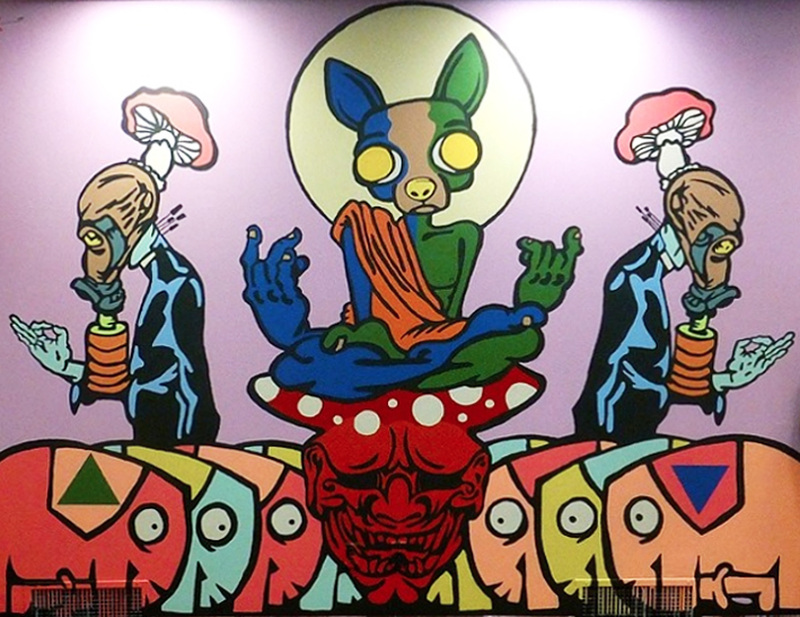 His psychedelic, pop-inspired, meditative murals drew heavily on street and graffiti art. Slowly the latent religious iconography of his “Soma” and “Trickster” characters gave way to a series of prayer bead murals in 2014. He soon discovered the keyed up colors he had originally based on chakra research to be little more than a westernized appropriation, and the true chakra tradition had little to do with his color palette. Wary of colonializing his subject matter, he pared back to black and white. 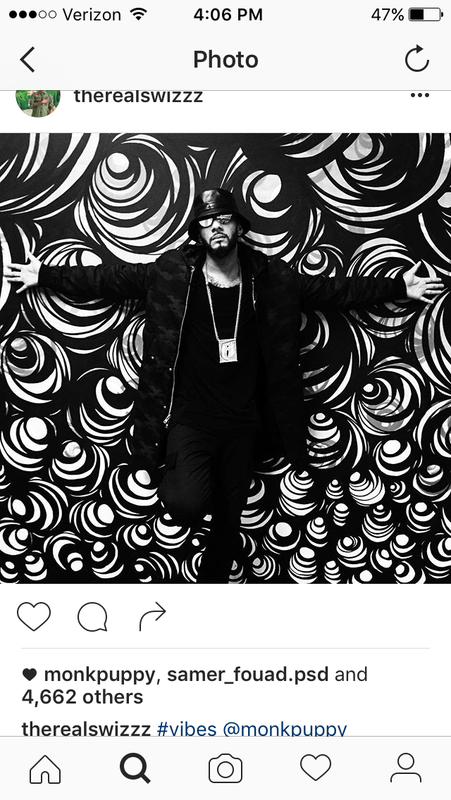 But when hip hop producer Swizz Beatz instagrammed photos of himself posing in front of Clouds Tiptoeing around a Giant’s Neck, Oquendo once again writhed under the “urban artist” box closing in around him. 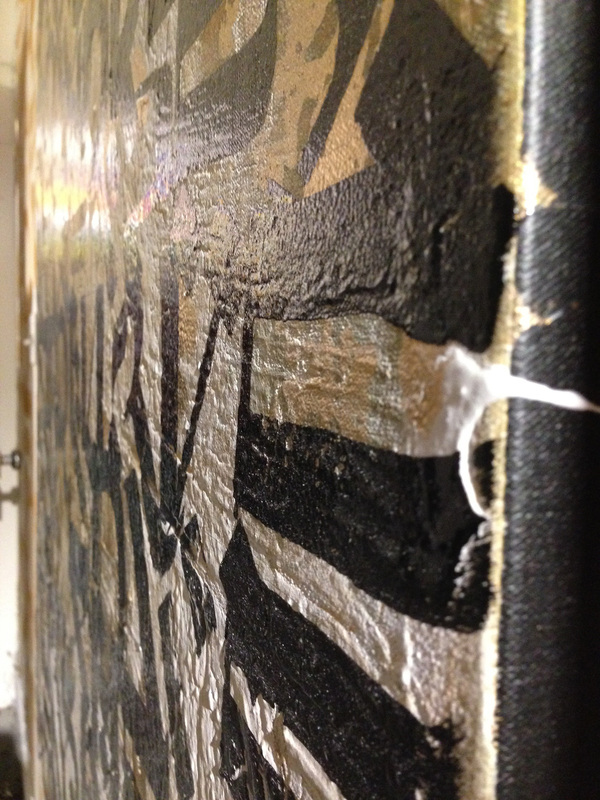 He laughs, noting that his first exposure to urban art came from within the sanitized halls of higher education, and he wouldn’t feel authentic as an urban artist anyway. During a residency at Mana Contemporary in 2015, he escaped the walls and landed his prayer beads on canvas. This gave way to an increased focus on the paint handling itself. Shortly after, he participated in the McCarter Highway Mural project, the second longest mural in the country. Curator Rebecca Jampol (also the curator of Metaphrase: Idioms) cautioned him that his usual process of color-by-numbers projection based muralism would prove too “clunky” for the scale of the project. Not wanting to be boxed yet again by a particular process, Oquendo reinvented his approach with a new emphasis on the improvisational brush stroke. 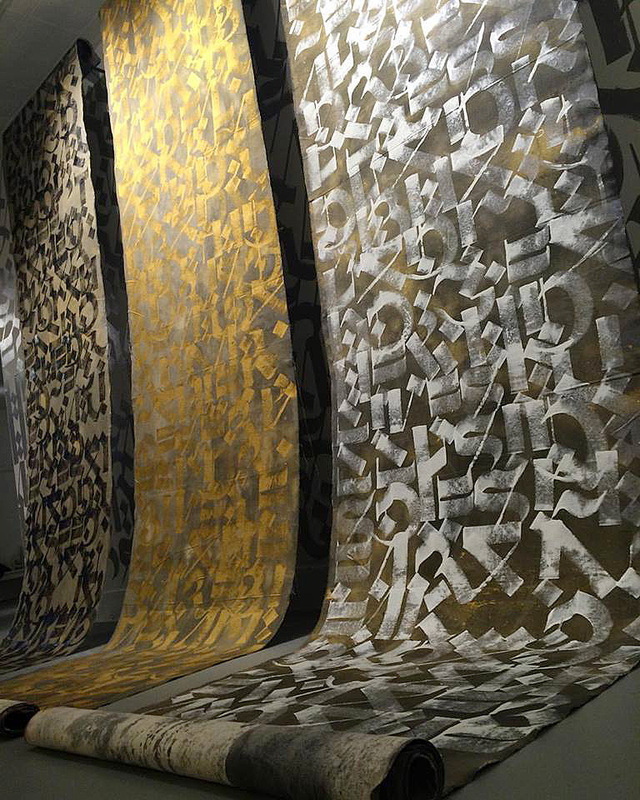 The work became increasingly about calligraphic mark making. Mitigating all along against the fear of being pigeon-holed, Oquendo migrated the meditative repetition of the prayer bead into the meditative repetition of prayer itself, and embraced a fixation with calligraphy. And so the Puerto Rican American muralist with a Christian upbringing refuses all those labels only to end up making work comprising exactly those points of reference. Interestingly, Oquendo confides that the Derridean refusal of meaning in his calligraphy has autobiographical roots as well. As a child he struggled with a learning disability he describes as somewhat similar to Dyslexia that caused most of what he read to behave much the same way his new font behaved for me in the gallery. And yet, in the same way that the mystical denial of meaning leads to a recollection of greater meaning that exceeds all labels, Oquendo’s work exceeds labels and transcends tokenization. Ordinarily I might not affirm a practice driven by a reactionary fear of labels, but in this case it seems somehow fitting, almost conceptually necessary. His is not this language or that language, this religion or that religion, this race or that race. Metaphrase: Idioms is language, race, and religion in all their complexities. Oquendo’s mystical refusal of boxes and labels mirrors the entire postmodern religious struggle, the search for a divinity that likewise exceeds the boxes and labels of a modernist, pre-globalized, pre-pluralistic society. If the viewer encounters a God in Oquendo’s work, it is not this God or that God, but a God that just is. And after all, is there not something of otherness – of being too foreign for here, of not quite being home yet – inherent in every theological yearning? May we all, extranjeros that we are, be comforted by a “tadpole tail” mantra along our pilgrim journeys. 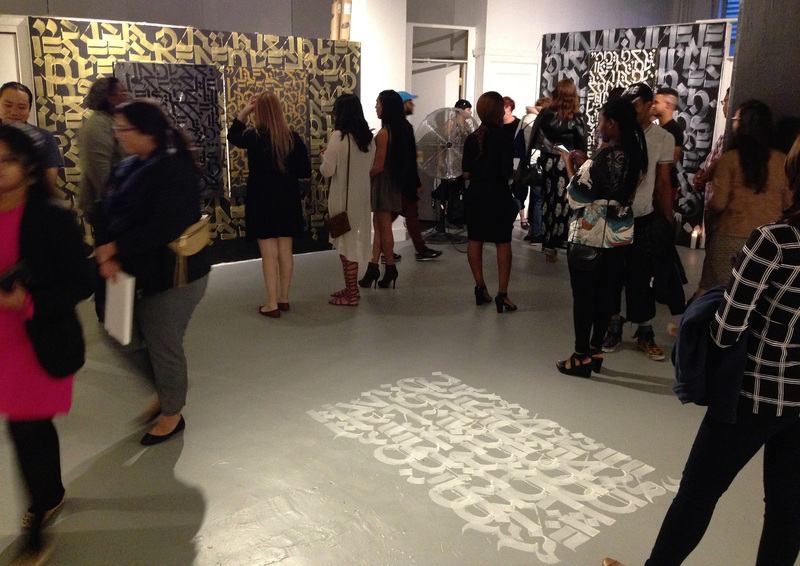 “Metaphrase: Idioms” closes today, on view at Solo(s) Project House, Newark, NJ from 9/16 through 10/1. 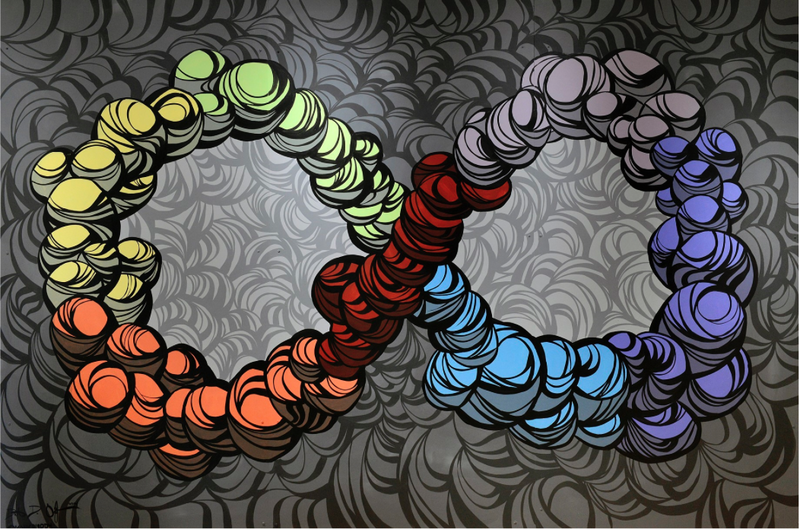 For more of David Oquendo’s work, visit www.davidoquendo.com, and follow him on Instagram at @MonkPuppy. Wonderful, piece of writing, “after all, is there not something of otherness”. Just loved it, Thanks. Thank you for reading Megan.